Top Lebanese political analyst Nasser Kandil, said that former Yemeni President Ali Abdullah Saleh drank the Saudi/Emirati ‘cup of suicide’ by leaving the Ansarullah Houthis and siding with the Saudi-led coalition. Kandil, who is Editor-in-Chief of the al-Binaa newspaper, also said that the equations of the Yemen war have completely shifted today after Saleh’s departure, and that now, Ansarullah will respond to attacks on Sana’a with missile strikes on Saudi Arabia and the UAE. – Kandil: The (real) development is not the killing of Ali Abdullah Saleh in itself, in the sense that (this) event now enables us to choose which side we’re on in Yemen. No. There are up until now half a million Yemenis who have fell in this war, some as casualties, some as martyrs, and some killed, (their description) depending on our ethical standpoint. And Ali Abdullah Saleh, who was involved in this war, at one point on one side and thereafter on another side, and was involved in Yemen’s past wars, and he is a military man anyway, and he took a decision upon himself, he was not (killed) after being deceived or backstabbed, he even declared he is in an open confrontation, thus based on such calculations death is one of the (possible) consequences. Certainly we did not wish to see such a scene, but what is also certain is that we have no right to summarise the whole Yemeni scene, and the martyrs of Yemen, and the blood (spilt) in Yemen, and all the suffering in Yemen, to put it all in one hand and say ‘that’s it, the (killing of Saleh) has changed everything’, and now we will change our (political) position, outlook, and stance based on this. – Host: isn’t work being done to change political alignments by using this event (of Saleh’s killing)? – Kandil: Here I wish to say: I am one of those who love and support Ansarullah, I am of those who appreciate the greatness of their (political) analysis, the clarity of their vision, and their determination, their skilled administration, their tactics, their achievements, and the difficulty of their task, yet I did not wish for them such a scene (of Saleh’s killing). Period. Full stop. I say this as an ethical responsibility, (especially) considering my (political) alignment with this group. And I know that some of their commanders wished that a different ending (for Saleh) would have occurred, however, this here has nothing to do with political alignments. Now in terms of political analysis, ofcourse we need to be careful. 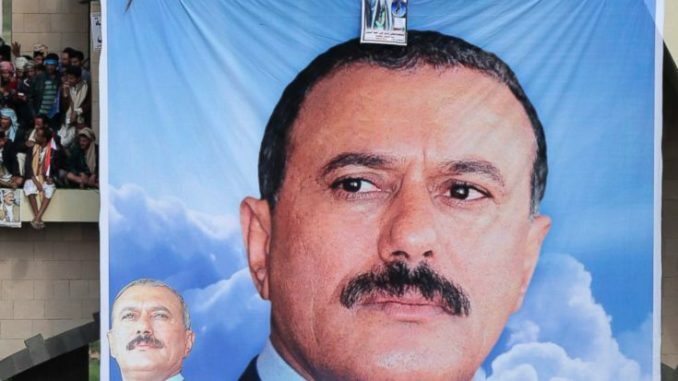 Is the killing of Ali Abdullah Saleh the end of the war, or its beginning? Because many today say this is the beginning of the war, that ‘you have not seen anything yet’. The (Yemeni) tribes, the army, and all of Yemen will stand together and the equations will all change. That ‘you will see things (in the war) which you have not seen yet’. I say that this needs to be debated politically. Whether this is true, or whether it is intimidation, or an exaggerated deduction, or a type of superficial superimposition of other images on the Yemeni scene. This is not the killing of Rafiq al-Hariri, and this is not the execution of Saddam Hussein, nor the killing of (Muammar) al-Gaddafi. Four months ago, at least, from the date of Trump’s visit to Saudi Arabia, the deal that was reached between Mohammad bin Salman and (Jared) Kushner, and which was sponsored by King Salman and Donald Trump, contained five headings, which basically – what does America want? America wants Israel to have the upper hand in the region. Does anyone have any doubt about this? Meaning that is there any confusion or doubt that America, which is losing here, here, here, and here, and which has an interest in reaching a compromise, and which (now) has open contacts with Russia, and it is heading towards an understanding with Iran which it cannot nullify and escape from, meaning that the logic of compromise reigns in America (at the moment), yet what is America’s (main) obstacle in reaching compromises? Israel. Okay, how does it make Israel a major player in the compromises? Ofcourse, Trump’s announcement that he will move the (US) embassy to al-Quds (Jerusalem) and recognise al-Quds as the eternal capital of Israel, and the ‘deal of the century’, this was all agreed upon, and you said you will get back to in the program…What are the fires that had to be kindled to confuse the resistance axis and force it to take one step back? There were four fires that were lit. The first fire was Qatar, which you referred to. Mohammad bin Salman took the authority to smash into Qatar. Who turned off (the fire)? The Iranians. The second fire? Iraqi Kurdistan and its separation. Who turned off (the fire)? The Iranians. Ofcourse Im not taking anything away from the Iraqis but Im talking about the big picture. The third fire? A war in Lebanon, that Hariri launches in the same manner as Ali Abdullah Saleh. (Hariri) was supposed to come to Lebanon, announce his resignation, call for an intifada (uprising), (and say) ‘we will not live with the presence of (Hezbollah’s) weapons, even if it costs us our lives’, ‘we will fight till the last breath’, ‘come down to the streets O’ security (forces), O’ army (soldiers), O’ Lebanese…fight Hezbollah’. – Kandil: No, but how did he fail? – Host: an interconnected scene of the region, okay. What I wish to point out is that they (Ansarullah) were successful in (reshaping) the structure of the (Yemeni) army, and within (Yemen’s) tribes – because the supposed sectarian obstacle that is present in the minds of many in the (Arab) East is not in fact present in Yemen – therefore (Ansarullah) are the sons of these tribes, there are no problems between them and these tribes. So they were successful in placing one criterion that was agreed upon by all the wise leaders and chiefs of the tribes, which is: whoever leaves our alliance in confronting the (Saudi) aggression we will all hold him accountable’. This was the agreement. – Kandil: I will explain to you…based on this, to those who say the war has (just) begun in Yemen, (and that) the tribes, the army, (and) the killing of Ali Abdullah Saleh will cause this and that, I say that this is a decisive bullet (that has been fired) in one of its stages, what is coming up from now on: it is no longer possible for (the Saudis/Emiratis) to create an alternative (card) in the place of Ali Abdullah Saleh, neither in the battlefield, nor in politics; Ansarullah has other traditional allies which will cover up for the vacuum left by Saleh’s departure, and thus, the conflict now is face to face. Ansarullah versus Saudi Arabia. Everything that will occur against Sana’a, it will be responded to (by the targeting) of Saudi Arabia. This is a decision that has been taken, this is not some analysis, this is based on (precise) information. – Kandil: …will be under the target of (Yemeni) missiles – this is a (decisive) decision, the issue is finished. And I know that Sayyed Abdul Malik al-Houthi and the Ansarullah leadership are not (merely trying) to intimidate, (rather) they know that the final deadline that was given to Saudi Arabia, it was extended for four months because of the explosion of Ali Abdullah Saleh. They still had this card on reserve, they had Masoud Barzani, Saad Hariri, and Ali Abdullah Saleh, so they said let’s use them. So the Americans extended (the deadline), lest they can do something and change the equations, (perhaps) they could explode the situation on Iran’s borders, and explode the situation in the face of Hezbollah in Lebanon, and change Ali Abdullah Saleh’s (political) position so he can take Sana’a off the Houthis, then great! – Kandil: Yes, today…Saudi Arabia has no more cards, and this is why American-European pressure has begun – and will grow – aimed at stopping the war and reaching a compromise (in Yemen). Therefore the balance of terror that Ansarullah is establishing now is (perfectly) timed, because Saudi escalation will not be welcomed throughout the globe.